There's a "pattern" we should be aware of, CAIR-Chicago's Ahmed Rehab told America during a recent appearance on Fox News. It has been Muslims who have helped "foil" recent terror plots and report extremists, he said. In many cases, that's true. Rehab and the Council on American-Islamic Relations (CAIR), however, can't take credit for helping encourage this pattern of behavior. Refused to wholly condemn Hamas. Minimized extremist pockets in U.S. society. Accused the government of fabricating its own terrorists. Alleged that terrorism prosecutions are not based on evidence, but attempts to silence Muslims and activists for Palestine. During a 2006 episode of BBC's "Hard Talk" Rehab was asked by the BBC's Stephen Sackur if he could give a "straight forward" condemnation of Hamas. "Do I condemn the hospitals run by Hamas, or the schools that help children learn, in Hamas?" Rehab answered. "No, I don't condemn that. But I do condemn the blowing up of Tel Aviv pizzerias or cafes." Hamas isn't the only radical group for which Rehab has offered no condemnation or a qualified one. The radical groups Hizb ut-Tahrir (HuT) and Revolution Muslim (RM) have both encouraged their followers to kill individuals with whom they disagree. Rehab has minimized their significance. Just this year, RM has issued death threats against British parliamentarians and the creators of the television cartoon "South Park." Similarly, HuT leaders have encouraged Australian Muslims to kill anyone who might stand in the way of establishing an Islamic super-state. As the IPT recently reported, ideological groups like RM are shifting to a more operational role in terrorism. After the "South Park" threat, Rehab did say that RM should be "seriously investigated," but he also implied the group might be a set-up. Rehab wrote that "whether true Muslims or agent provocateurs," the guys behind RM, "are five community outcasts." "Most suspect the group is fraudulent," he added. Rehab hinted at a conspiracy by mentioning that the group's "mysterious leader" converted to Islam after living in Israel. CAIR's national spokesman Ibrahim Hooper amplified Rehab's argument when he claimed that, "most Muslims suspect they [RM] were set up only to make Muslims look bad." When HuT held a Chicago conference in the summer of 2009, Rehab said he felt no need to condemn them, but that he just shouldn't support them. "I cannot claim that there is any danger to the group. As far as I'm concerned, they're a non-violent group. That's the litmus test of whether we should issue something," Rehab said. During a series of federal terrorism prosecutions, Rehab has repeatedly criticized the government's case, often claiming entrapment or fear mongering. He said the government radicalized "The Bronx Four," four men who have now all been convicted on seven counts related to a plot to attack a New York synagogue and the New York Air National Guard Base. "[I]t turns out that the radicalization 'tipping factor,' if you will, was none other than a paid government agent-provocateur," Rehab claimed in a piece published by the Huffington Post shortly after the men were arrested. He backed the Holy Land Foundation (HLF) and its five former officials who were found guilty of funneling millions of dollars to Hamas. Rehab called the government's case against HLF "particularly worrisome because of its dubious legal arguments." According to Rehab, the government's evidence "ranged from the mention of the word 'Hamas' by the defendants to textbook guilt by association." He even went so far as to call the HLF trial "a case against the Muslim community" during a 2007 town hall meeting in Texas. The presiding judge saw things differently. Evidence proved that "the purpose of creating the Holy Land Foundation was as a fundraising arm for Hamas," U.S. District Judge Jorge Solis said as he sentenced the defendants to lengthy prison terms. Evidence in the HLF trial placed two of CAIR's founding officials, Omar Ahmad and Nihad Awad, at a 1993 Philadelphia meeting of a U.S. Hamas support network. Yet, Rehab has asserted that neither Awad nor Ahmad have ever been "tied to Hamas." 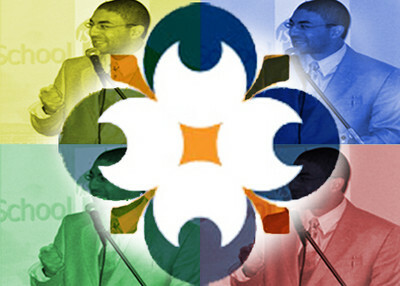 The FBI, however, cited prosecution documents from the HLF trial when it cut off contact with CAIR, concluding the organization is not an appropriate outreach partner and indicating that would continue "until we can resolve whether there continues to be a connection between CAIR or its executives and HAMAS." In addition, Solis rejected CAIR's attempt to be removed from list of unindicted co-conspirators in the Holy Land case, finding "ample evidence to establish" an association between CAIR and Hamas. Among the exhibits were transcripts from the Philadelphia meeting showing that CAIR's Ahmad called the gathering to order, saying it was a meeting of the Palestine Committee. Over the course of a weekend, committee members discussed ways to "derail" the U.S.-brokered Oslo accords, which tried to lay the foundation for a lasting peace between Israelis and Palestinians. Additionally, a Palestine Committee phone list submitted in the trial lists both Nihad Awad and Omar Ahmad a.k.a. Omar Yehya. Ahmad also appears in the address book of Hamas leader Mousa Abu Marzook on two different pages. Rehab has also criticized another Hamas-related prosecution involving a member of the terrorist group named Muhammad Salah. Rehab argued that Salah was "only guilty of being a bold Palestinian activist." The Muslim community, Rehab told the Chicago Tribune, saw Salah as being "caught in a political drama at a time when it's difficult to be a Palestinian or a Muslim." Salah was named a Specially Designated Terrorist (SDT) in 1995 by the U.S. Previously, Salah pleaded guilty in an Israeli military court to participating in Hamas affairs. In 2007, Salah was found guilty of providing misleading statements to a U.S. court through his lawyers, specifically that he "never provided or delivered funds for the purpose of supporting Hamas." Read our full report showing how Ahmed Rehab is a part of that effort here. War Is Deception: CAIR Is A Front For Hamas. The Serpent In The Grass & The Enemy Within: CAIR-Chicago Ahmed Rehab is armed with a Silver Tongue of Deception and a Jihadist Sword for Dispatch of the unwary Infidels.